At least I had a minute to run to the bathroom. I do not understand Bruce’s obsession with “Wrecking Ball”. Musically it’s an interesting song, but lyrically it’s so weak it’s almost embarrassing, and it’s also completely irrelevant outside of Giants and maybe, MAYBE the Spectrum. Is it because it’s a new song? Do fans love it because this way they get to show everyone what uber-fans they are because they know this brand-new ‘unreleased’ song (‘unreleased’ because it is on freaking iTunes). It gets weaker with every performance he tries to rewrite it for. I just feel like the reception is a gross overreaction. What am I missing? I liked his decision to go into the album RIGHT AWAY. Part of it, I suspect, was probably because “Hungry Heart” couldn’t sit in its usual spot, but I am sure the rest of it was the 90 minute mountain climb awaiting the E Street Band. 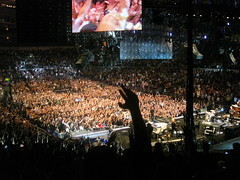 I am writing about the album for brucespringsteen.net, so you will have to go read my thoughts on that there. Until that happens, you can read a separate writeup of that. What I wanted to talk about here was the rest of the show last night. To be honest, I did not expect much of Sunday night’s show once he was done with the album, especially with what happened with Saturday night’s show. Frankly, I was just wiped out, and fine with sitting through a few songs of “Sunny Day”/”Working On A Dream”/et cetera. When he changed guitars and hit a chord that was clearly going to be “Atlantic City,” my thought was, “Well, this is random” – welcome, but random nonetheless. I thought “Badlands” was going to be “Born To Run” – and then we got “Born To Run”. I’m trying to guess how much longer he thinks he’s going to play since we were edging 11 at that point, and instead we got “Seven Nights To Rock.” I am thinking, “Is he trying to kill me?” but given that the 60 year old was showing no signs of flagging, well, I can’t exactly sit down on the job. The people on the other side of us decide that it’s time to leave right about now. At some point, someone in the audience held up a sign, and to be fair, it wasn’t entirely clear that Bruce wasn’t about to 1) ask for them or 2) cue “Raise Your Hand,” so I can’t fault them. Once again, he pulls “Sweet Soul Music” out from the audience, which we think is pointless, as there is no horn section tonight, just Curt and Clarence, but no, he decides that TONIGHT he is going to do it. The audience seems… confused. Perhaps I am a snob. (No, actually, wait on that.) Perhaps I just like to imagine that I live on a planet where all right-thinking music fans would riot at the very idea of Bruce Springsteen & the E Street Band playing “Sweet Soul Music” again for the first time in many, many years. In the cold light of the next day, pragmatically I’d like to suggest that we were all just TIRED. I think Bruce thought this was going to be another “Higher & Higher,” where he could just will it to happen and it would manifest itself. It took a few minutes to get Curt onstage, where Bruce held up the sign and said, “Hey, Curt, you know this one?” – and then thank goodness, Roy had the riff (I’m sure Charlie did too) and the ESB launched into the sloppiest, raggediest version of “Sweet Soul Music” you have ever, ever heard. I wouldn’t go so far as to say that Arthur Conley was rolling in his grave – well, except from laughter. “No Surrender” was fine. “American Land” is what it is. “Dancing In The Dark” was totally unnecessary, except for the four women who climbed onto the platform at the back of the pit. I was actually okay with this example of stupid fan behavior; no one got hurt, no one was going after the band. Another sign that I didn’t even see him take – “Does anyone know this one?” We are yelling for him to go get Garry out from behind the drums – I’m sorry, an Elvis Presley song? Calling Garry W. Tallent – and they manage to cobble it together, except for the fact that I don’t think Kevin had enough notice to go get it on the prompter, so the audience carried him through the middle verse. It was sweet. It was unexpected. It was random. It was starting to feel like he was looking to break the midnight curfew. I know I declared it should be so, but when they started playing the intro to “Higher & Higher,” all I could think was, “Where is he getting this energy from?” I liked that Patti got a verse. I even liked the notion of Bruce taking Patti, Curtis and Cindy out to the back platform, just like he did on Saturday night. It was messy. It was chaotic. It was a little nuts. It was a little silly. It remains the greatest closing number for the E Street Band in many, many years, and if I ever meet the person who brought that sign to Philly, I will buy them a beer. It was a great MSG night. I cannot stress this enough. People were on their feet all the way up at the top of the venue, even the luxury boxes were packed full of people leaning out over the edge and waving their arms. There were flags of half a dozen countries being held up or hung over the edge of a level. There was dancing. There was loud, very loud, singing. For so much of it, it was very much like how I remember it was, going to the Garden for concerts at the end of the 70s and into the 80s. There were also way, way too many people talking through songs that hundreds if not thousands of people had never ever heard Bruce Springsteen perform. I do not know how to make sense of that. I really do not. There were moments that it was all I could do to try to insert my physical being into the musical notes being played, so I could be surrounded by that and not inane chatter. It is just – so sad. I felt a little like Cinderella leaving the Garden last night, a little unwilling for the magic to wear off, a little unwilling to go back to mundanity. I can still see (and hear) “Serenade” in my head. I can still feel “Fade Away”. I can still put myself in the emotional spot I was when “Crush On You” started. Not much else matters, in the end.